Closing the deal is a milestone in any merger, but success is defined in the quality of the subsequent integration. The realisation of the added-value inherent in the deal is dependent on the constructive and active cooperation of the staff in this phase. Achieving integration goals is a challenge that is complicated by a variety of merger-specific factors. Managers and staff need to actively manage the integration project for which they are often ill-prepared at the same time as they ensure that the day-to-day business carries on. This requires a specific merger competence that in turn requires a competent and professional management of complexity in intransparent situations through a clearly structured project management approach that combines change management with a professional management of the organisation’s structure. We support companies in a professional merger consultancy with in-house seminars to help achieve their merger targets despite the inherent turbulence and at the same time develop their merger-management competence as a skill. Using our integration diamond, we help our clients to develop their specific and individual integration strategies. The integrated use of all six integration fields helps to develop a complete integration strategy that is capable of being implemented through the corresponding project management structures and change architecture. The desire to achieve a quick integration in order to be able to concentrate on the say-to-day business again contradicts the need for a thorough, step-by-step and time-consuming integration process. The need to provide quick answers both within the organisation as well as externally can lead to statements that are not sustainable and need to be revised. The desire to leave things as they are in order for each side to get to know the other better sits uneasily with legal and statutory requirements. The diversity and independence of many operational areas and their desire for unity and standards contradicts the idea of cultural diversity. The achievement of savings and synergies promised during the deal stage contradicts the need to get to know things better and to concentrate on innovation and customer needs. The challenge of developing a reliable complete planning concept contrasts with the fact that much information is only available after the deal has been done. The early concentration on the specific integration challenges and their strategic resolution through realistic and practical activities form the heart of our post-merger integration consultancy. frankfurter gruppe uses an integrated PMI-methodology and supports your integration project hands-on throughout the entire duration incl. review and lessons learned. Setup of a stable and lean project organization that enhances a meaningful dialogue between the various actors and roles within and aside the project as well as a effectful and precise tracking and controlling. Post merger integration-projects are a demanding and complex sub-set of change projects, they need an intelligent change architecture and practical implementation steps to fully realize the potential of the expected value drivers of the deal. Our extensive experience over 10-20 years of partner-level consulting in integration- and change-projects gives us ürofessionalism and confidence in approaching issues in the context of cultural integration with adequate and well-considered formats. Leadership needs specific support before and during the integration: We prepare, coach, qualify and support leaders to be guides and points of orientiation for staff in times of change and complexity. Mergers have a tendency to fail. Only those that learn and gain competence will achive professionalism in integration work. We actively transfer knowledge and insights and support you as a truly learing organization. 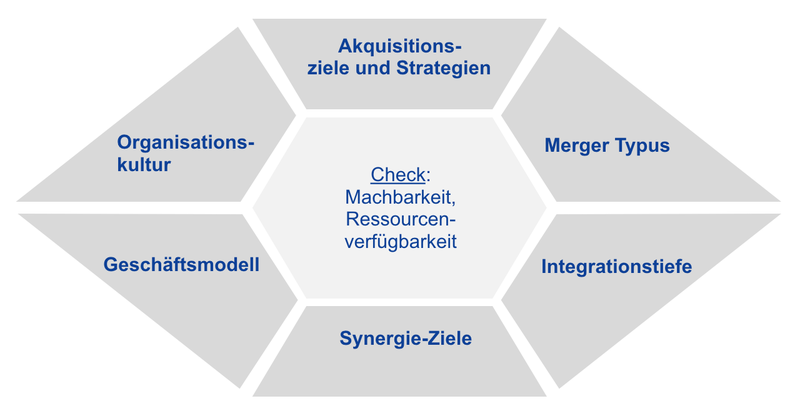 Strategy processes in central busiess functions: slaes, marketing, SCM, R&D, manufacturing etc. Learn more on merger integration!